As is the case with most fruits and berries, the number of calories in blackberries per unit weight is not terribly large. Though not advertised as a "negative calorie food", which weight loss experts love to promote, one would be hard pressed to gain any weight on a diet consisting largely of blackberries. To start out with a little hint, an average size blackberry, perhaps the size of an average person's thumb, weighs around 6 grams, or 2/10 of an ounce. 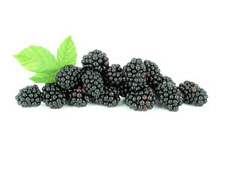 One berry will contain roughly 4/10 of a calorie, or put another way, 2 1/2 blackberries will yield a calorie of energy. What that essentially means is that if while out picking blackberries, you eat a few every so often, you'll most likely burn away all the calories consumed, plus a number of additional calories, as you fight your way through the vines. The definition of a negative calorie food is one that takes more calories to digest what is eaten than are contained in the amount of food eaten. In the case of the blackberry, it probably takes more calories to pick them, than what ends up with in the pail when done. Blackberry Facts - The blackberry is a perennial plant with biennial stems, which simply means that this year's new stems will produce next year's crop of berries, after which the stem will die off. A rapid grower, blackberries are grown commercially in many places including the state of Oregon, the world's larges producer and distributor of blackberries. Among the various blackberry cultivars developed and grown there, the Marion berry, named after a county in Oregon, may be the most familiar to people. Blackberries thrive in Australia, New Zealand, and the Pacific Northwest states of Washington and Oregon, where in the wild state, the plant is considered both a blessing and a curse. The wild blackberry is a very invasive plant, but what saves the day for the plant is the pleasure many people get from a blackberry picking outing, a late summer and early fall ritual to many. A Few Calculations - Getting back to the amount of calories in blackberries. Here are a few calculations to give a clearer picture of what the numbers mean. |If 1 calorie per 2.5 berries doesn't quite explain things, 100 blackberries will contain about 40 calories. If you pick a bucket of blackberries, about 10 pounds of them, you'll have close to 620 calories worth of berries in the bucket. Walking at an average speed for an hour burns 240 calories. It will take 1200 blackberries to provide the energy to do that. Similarly you'd need 500 blackberries to swim for an hour, and 1360 blackberries, about 17 pounds of them, to give you the 545 calories you would burn in a hour of cross country skiing. Blackberry Nutrition - The bottom line is, we don't eat blackberries to provide us with the calories we need to get through the day. We eat them for their nutritional value, which is very high, and of course because they taste good. Blackberries are rich in vitamins, especially C, K, and one of the B vitamins, folic acid. They are also a rich source of manganese and are near or at the top of this list as far as foods rich in antioxidants are concerned. Not just the berry itself, but the seeds are highly nutritious. Strain away the seeds, which for making juice and smoothies many prefer to do, and you're taking out a good supply of omega-3 acids, dietary fiber, and carotenoids. How Many Calories In A Drupelet? - The tiny individual fruit "balls" making up a berry by the way are called drupelets, which can only form on blossoms which have been pollinated. That is why a blackberry vine may not produce well or provide large berries (early berries are usually the best), if the spring weather has been exceptionally cold and rainy. Just a few days of weather that keeps the bees away, can significantly influence the quality of that summer's harvest.